Optimize your leasing performance and streamline workflows with the Intelligent Lead Manager solution. 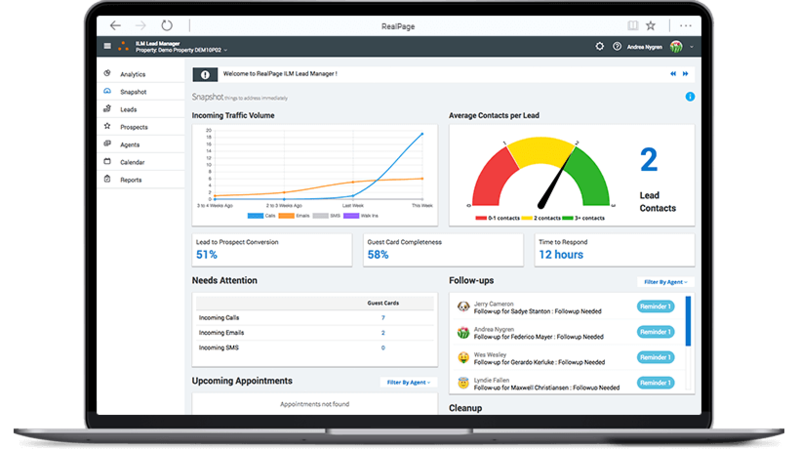 RealPage® ILM Lead Manager is a comprehensive lead management solution that helps multifamily organizations increase revenue by focusing on leasing activities that produce the most value. This solution is specifically designed to help you make the most of your time by organizing and prioritizing your sales funnel. Keep your leads more manageable. Convert more leads to prospects. Communicate with prospects more effectively. It’s all possible with RealPage ILM Lead Manager. Simplify complicated processes, streamlining work with all of your stakeholders. Capture, consolidate and validate market data for fast accurate decision making. Gain transparency across your entire portfolio to ensure you meet your targets every time.